Big-ticket changes. A 64-bit overhaul. Faster everything. A rewritten Finder. Microsoft Exchange compatibility. All-new QuickTime Player. If Apple wrote it, this book covers it. Snow Leopard Spots. This book demystifies the hundreds of smaller enhancements, too, in all 50 programs that come with the Mac: Safari, Mail, iChat, Preview, Time Machine. Power usage. Security, networking, build-your-own Services, file sharing with Windows, even Mac OS X's Unix chassis-this one witty, expert guide makes it all crystal clear. I was disappointed in how little this thick book helps me. There is a lot of isolated screens that the author never explains how he got there.I am sure he knows a lot about the mac os but I am an old pc guy and this book didn't help me. Since I got the book, I have only gotten more frustrated since I now have a book which doesn't help and a mac that I must learn. The book that should have been in the box! Great book----he is right, should have been in the box. Very easy to understand. 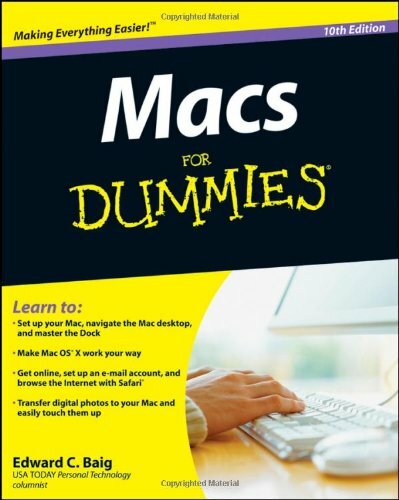 The book to have with the Mac snow leopard! As a lifelong and very comfortable PC user, I purchased my first Mac with the popular misconception that it would be user friendly and intuitive.People told me not to worry, just do what seems logical and the Mac will respond.Right?Wrong.Very very wrong.Don't misunderstand me:I like my Mac, especially the big gorgeous monitor, the wireless mouse and keyboard, the ease of start-up, Garage Band, and lots of other stuff.But easy to use?Heck, there isn't even a backspace key!With the PC, my hand hardly ever reached for the mouse, and suddenly I was grabbing for it constantly.The Help menu wasn't very helpful, and the underlying set-up seemed mysterious and cumbersome. Finally a person who's smarter than I am suggested that I pick up a "Mac for dummies" type book.THE MISSING MANUAL is that book, and it is a blessing.I am finally discovering the universe that resides inside that snazzy monitor, learning to leave the mouse alone and having a great old time doing it.The book's subtitle is "the book that should have been in the box. "I wholeheartedly agree. If you're a new Mac user, you need this book.It's well organized, clearly written, has a big fat index, and even provides web support.Thanks, David Pogue. Weighing in at over 3 pounds and close to 900 pages, this book isn't just the missing manual, but the definitive guide to everything Snow Leopard.If it isn't in there, you probably don't need to know it. Seriously, though, this is a great guide and each time Pogue comes up with a new edition of his Mac OS Missing Manuals, they just keep getting better and better.Similar to previous editions, the author takes you through every aspect of the operating system and the included applications and even some of the iLife apps.Menu commands, their functions, and their relation to real world situations is a hallmark of the Missing Manual series.Screen shots are used where appropriate but not so many that you feel like you are reading a comic book.Of course, sprinkled throughout the book are tips, tricks, and "nostalgic corners" telling us how we got to this 6th generation of Mac OS X. Unlike previous editions of the book, the author is including more of the intermediate users in his mix.Many more advanced topics aren't just mentioned, but clearly explained.In particular, the book explains the difference between Applescript and Automator and how to write practical scripts and workflows the average user would benefit from.Other more advanced topics include Windows and Mac file sharing (especially the problems Windows 7 poses), virtual private networking, and top "useful" unix commands. The book is designed to be a reference guide more than a how to or walkthrough book.The table of contents and index are indispensable tools for zeroing in on exactly the right command and program to get the job done.Every IT department and help desk should have a copy of this book. Learning to use a Mac is not a piece of cake, but once you do, the rewards are oh-so-much better. No viruses, worms, or spyware. No questionable firewalls, inefficient permissions, or other strange features. Just a beautiful machine with a thoroughly reliable system. Whether you're using Windows XP or Vista, we've got you covered. Learning Snow Leopard -- Once you've moved into the Mac, a final task awaits: Learning your way around. Fortunately, you're in good hands with the author of Mac OS X: The Missing Manual, the #1 bestselling guide to the Macintosh. Moving from Windows to a Mac successfully and painlessly is the one thing Apple does not deliver. 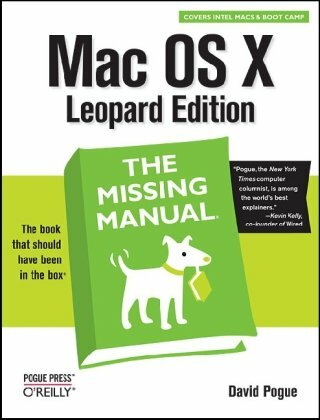 Switching to the Mac: The Missing Manual, Snow Leopard Edition is your ticket to a new computing experience. Just exactly what I need as I move from the world of the PC to Mac.Clear and cogent. Thanks Mr Pogue. Who could give this one star? This is a very well laid-out book rife with tips, screen shots, and examples. I'm very happy with my purchase. I don't see how anyone could give this one star. This book was delivered to Australia very quickly and was in new condition as described. An excellent transaction. To be honest with you, I have gotten more information from Google about to use iMac programs than I do did from this useless book! In Mary Mac's Tea Room, author and owner John Ferrell brings together over 100 classic recipes from this venerable institution of Southern comfort food. When Mary Mac's opened in 1945, it was one of 16 tea rooms around Atlanta, Georgia. More than 60 years later, it stands alone in carrying on the tradition of bringing great Southern cooking to everyone from blue collar workers to celebrities. Love this book - Mary Mac's Tea Room has been and guess it always will be a "true southern" restaurant icon...This is more than a cook book: lots of history here, as well as, photo's memo's of staff and "famous" guest - Tim Conway/Harvy Korman, Richard Gere (who seems to have a received a proposal from one of the waitresses), just to name a few...WOW! These receipes are great (i.e., "Cream Cheese Pound Cake", Peach Buttermilk Pancakes, collard greens and "pot likker", Blackberry Jam Cake to name a few) and you've just not eaten until you've had Mary Mac's "Georgia Peach Cobbler!!! I loved the photo's of food/staff/friends.What more can you ask for in a cookbook! Not only are there awesome receipes awaiting, but the history in these pages makes for down right "good" reading. I truly enjoyed eating at Mary Mac's while working at Ga Tech... ordered an extra copy for my son as he loves to cook "southern". Quintessential Southern cooking, the focus of Mary Mac's Tea Room, is in the limelight of this unusual cookbook. In operation since 1945 under several owners, the tradition never changed. The recipes are simple with a small number of readily available ingredients. They are well-written, easy to follow, and in logical order. Many are illustrated with large, professional food photos. The index is very good with cross references (though page errors did slip in). Fried Okra, for example, is under both F and O. This book is much more than a traditional cookbook -- it is filled with historic information and photos mainly of this landmark Atlanta restaurant but also to lesser extent of central Atlanta. Short chapters are devoted to history, to personal experience of the owners, to both loyal and celebrity customers (though a bit overdone -- Richard Gere appears five times), to workings of the kitchen, and to devoted staff, some of whom spent decades in the Tea Room. Full-page photos of many old-time staff members with their comments in sidebar add a delightful personal touch. Many stories from the past are equally charming. This book is very much for Georgia readers. For genuine Southern recipes, it is hard to beat. Their Pepper Sauce is Boss! I recently received and have read from cover to cover this wonderful southern cookbook. Having grown up in the South, I know a thing or two about what it takes to make southern soul food. I can say this book is a real classic. Greens and Pepper Sauce go hand in hand and the Pepper Sauce from Mary Mac's is the best. If you have never tried it you must. This is southern to the core. Sip some Sweet Ice Tea and endulge. 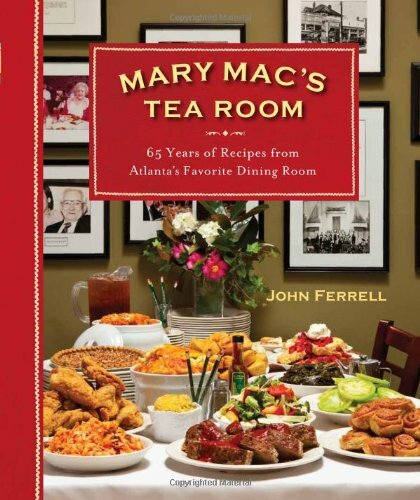 Just a glance at the cover of MARY MAC'S TEA ROOM makes mouths water, while the 125 recipes culled from the records of this Atlanta landmark restaurant will have you racing to the grocery store then heading forthe kitchen.Forget haute cuisine and think down homecomfort food, whether it be macaroni and cheese or fried chicken (yes, the secret to this succulent fried chicken is buttermilk). Manyof the recipes are almost identicalto those served 65 years ago when Mary Mac's opened in 1945.Today it is the last of 16 tea rooms that served Atlanta in the 1940s - long may she offer new guests "a complimentary cup of pot likker and a piece of cornbread"! After a warm, affectionate Foreword by Marie Lupo Nugren, daughter of Mary Mac's owner for 30 years, Margaret Lupo, the seven chapters offer Appetizers; Beef, Pork & Poultry; Bread & Beverages; Seafood; Pickles & Canning; Sides; and Desserts (including an irresistible PeachCobbler topped with a flaky pastry crust and served with vanilla ice cream). Tochoose a favorite recipe from among all ofthese would bean impossibility.The Mr. at our house would be happy if I just began at thebeginning ofthe book,cooked my way through, and then started all over again!However, if pressed he'd have toadmit to leaning toward the Country Fried Steak and Gravy with Peanut Butter Pie with Chocolate Crust for dessert. Today Mary Mac's is owned and operated byJohn Ferrell who promises to keep thetea room's traditions of friendliness, hospitality, and homecookingalive.He's aided by a faithful staff, many of whom have been with Mary Mac's for some 35 years (ShirleyMitchell baked their yeast rolls, corn bread, peachcobbler and cinnamon rolls for over three decades and is still busy in the kitchen).Aloyal, happy staff andlegions of delighted customers say more than words ever could about Mary Mac's Tea Room. Put some South in your mouth. For barbecue, you go to Birmingham (The Golden Rule and/or Dreamland), Memphis or Chapel Hill. For just flat out full-tilt-boogie Southern cooking done right, there's only been one place for years - Mary Mac's Tea Room in Atlanta. I must confess, i haven't eaten there in ten years or so, but if it had seriously changed for the worse, i'd have heard.Everyone in Atlanta would have heard. Mary Margaret Lupo founded the place in 1945, and at the time there were sixteen tea rooms of the same type in Atlanta - today there's only one.You walk in, sit down, read the menu that's printed fresh every day as what's available changes, and you write your own order on a little order ticket and hand it to your server. The standard meal has always been a fixed-price meat and two or three sides plate - three or four meats to choose from and several different sides. You can order a la carte, but it's not recommended if the rest of your group goes for the package deal, because it takes longer. And, if you've never been there before - some advice - arrive early. You will find letters and testimonials from all over the world on the walls - including one from the Dalai Lama.Jimmy Carter and James Brown are other habitues you might have heard of. Back in 1983, they published a cookbook with several of their most popular recipes. Now, the current owner (he's owned the place since 1994) has published a new cookbook. The Computer Club that I belong is using this text book to teach beginners on the Mac. An excellent resource. The Little Mac Book Snow Leopard Edition is an impeccable book. The book is full of very clear screenshots, very informative and a book that is valuable for anyone whether you are a beginner or not. I liked this book so much that I purchased another copy for a neighbor who has just purchased her first Macintosh. This book covers many, many things and is not boring or even close to it. The author, Robin Williams, has been constantly updating her Little Mac Books for years as the various operating systems change. When I was new to the Mac way back in 1993, my brother gave me a copy and I enjoyed it so much that I just about stayed up all night the first night I got the book, just absorbing all the neat stuff that the author pointed out. In my opinion, this book is a must have!!! 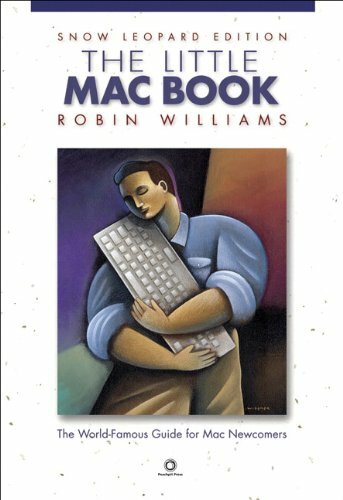 Robin Williams is a very smart woman and so i think this is a great 1st read but it doesn't do much for a seasoned MAC user. I bought this book because I am a new Mac owner and wanted to learn how to use it, after being a PC user for many years.At the same time, I bought a couple other books, which turned out to be much better learning sources.I probably misjudged this book.It turned out to be a very basic computing book and most of the information in it I had known for years.It seemed to me that it was better suited for someone who was altogether new to computers.It was not of much use for me.I think it probably is a good and easy book for beginners, but does not address the overall issues in learning to use the Mac. I have plenty of experience using Windows-based PCs and I wanted a book that would get me into the basics of a Mac quickly and painlessly.This did it.It does not contain information on how to use the applications that come with the Mac, like iMovie and Garageband, rather it tells you how to move around the operating system.There were short sections intended for people with no computer experience at all, like information for those who have never used a mouse before, but they were brief and easy to skip.There was enough information and quick tips to make this book worthwhile.Although there are sections seemingly intended for complete novices, I'm not sure if there is enough of that material to make this book useful for a beginner.But the book was a quick, easy read and saved me a lot of time fumbling around on my own.I would recommend it to anyone in my position who is looking for more of a "quick start guide" rather than an exhaustive, encyclopedic reference.I have to give it 5 stars because it seemed to accomplish what it intended. Macs are easy to use, but this guide helps you take advantage of all the cool features and make the most of your Mac. Fully updated, it covers the newest operating system, Mac OS X Snow Leopard, as well as iLife '09, iWork '09, and much more. Minibooks include Mac Basics; Photos, Music, and Movies; Browsing the Internet; Working with iLife and iWork; Other Mac Programs; Timesaving Tips with a Mac; and Mac Networking. Even though I felt I was an experienced PC user and thought I could well figure out the transition from PC to Mac, this book offered a comprehensive study and excellent source to find all the goodies not always evident at first glance. It works and is a basic "Get-Go" type self help book. It is helpful but truly not the ultimate get-go manual. Yes, if you are just starting out there are plenty of hints and helps to get you started, do not expect to get more out of this book than that. All in all, worth the $$'s spent. The only Apple-certified book on Mac OS X v10.6, this revised best-seller will take you deep inside the latest big-cat operating system—covering everything from installation to automation, customizing the operating system, supporting applications, setting up peripherals, and more. Whether you're a support technician or simply an ardent Mac user, you'll quickly learn and master the new features in Mac OS X 10.6, including native support for Microsoft Exchange Server 2007. Following the learning objectives of the Apple Certified Support Professional exam, this self-paced book is a perfect guide for Apple’s training and a first-rate primer for computer support personnel who need to troubleshoot and optimize Mac OS X as part of their jobs. Chapter review sections and quizzes summarize and reinforce acquired knowledge. I have gone thru the peachpuit press equivalent of this book already so I guess I have already learned most of the details. This book was dissapointing to me. It doesnt seem to go into much detail and instead is more of a gloss over what OS X administration is. Considering that its supposed to be prep for an exam I would hope that it would cover more than what you need to know for the exam. Instead it seems to cover just enough, if that. I may take the apple support exam, but I am not counting on this book to get me to pass! THe way the ordered goods were packaged should be improved, since all the ordered books, containing CD's, were delivered in a post bag. This caused the books to get damaged, luckily the CD's didn't got damaged. I've been using OSX since Jaguar. I'm decent at it. I've been through 4 or 5 of the Snow Leopard books. All the books that are good. Bible, Missing Manual etc. This one is by far the best for those familiar but not expert with OSX. No useless jokes. Concise and to the point with step by step instructions and just enough background information on the technical reasons for why you need to do things. Good diagrams. Good index. Good enough I'm not falling asleep when I read it. I'm actually looking forward to reading the whole dang thing. Even if you are not taking the test this is the book to get. I'm reading a library copy now but I might just spring for it. 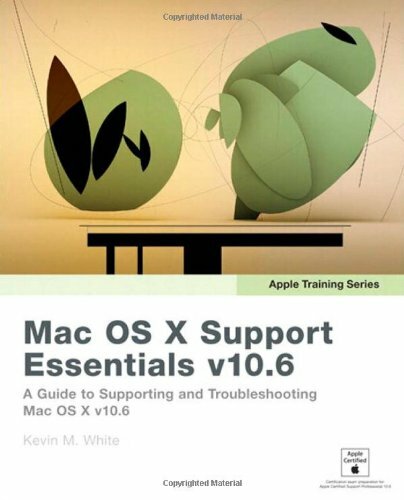 Mac OS X Support Essentials v10.6 is an extraordinarily well written book. It thoroughly covers the subject matter that it claims to cover. (When you read a book with this title you expect to learn exactly what this book delivers.) The pace is even and the progression is natural. The writing is clear and free of extraneous fluff--very skillfully done. No lame attempts at humor or other failed artifices that distract the reader. There is a lot of material, but the reader never feels like he is being buffeted by a whirlwind of facts and "how to" steps. But the most surprising thing about this book is the very high quality of the editing. I must be mistaken, but having read all 663 pages I can't remember a single typo. No (or extremely few) misspellings or mismatched cases, numbers, etc. Only a few places where there is any repetition, and those places are clearly intentional (for example, repeating a short note that was encountered in a previous chapter when discussing a topic from a different angle). The high quality of all major aspects of this book is rare in the computer industry and very refreshing. Mac OS X Snow Leopard is the newest version of the Macintosh operating system, and “Dr. Mac” Bob LeVitus is the ideal expert to introduce you to Snow Leopard. Mac OS X Snow Leopard For Dummies covers all the cool stuff and prepares you for the quirks, so whether it’s your first Mac or an upgrade, you’ll enjoy a truly rewarding relationship. From starting up your Mac to setting up a network and keeping in touch via iChat AV, Mac OS X Snow Leopard For Dummies gives you the scoop on the new features and improvements that help you do more work in less time. I just wouldn't be able to use my new iMac comfortably without Mac OS X Snow Leopard for Dummies. This is an easy read, detailed tour of my computer. Since this is my home computer I have no Information Systems Dept to call for backup.Of course, I could call Apple for help, but Dummies answers my questions before I even know how to formulate them. 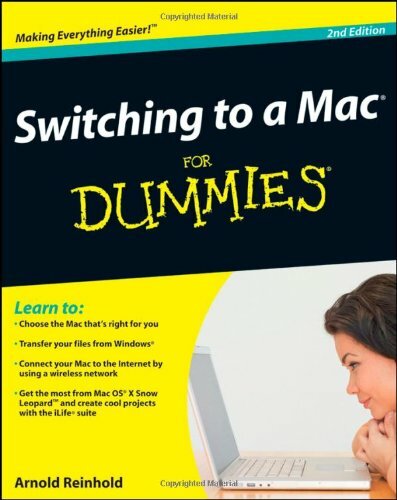 A good resource but I had purchased Switching to Mac for Dummies and really didn't need both books. 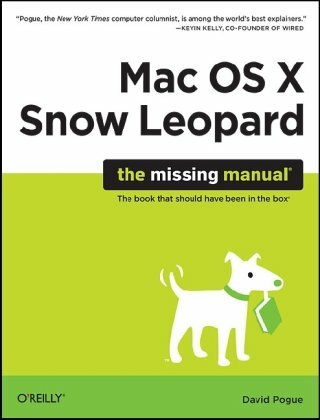 I purchased the electronic version of this book and it has a good overview of OSX Snow Leopard but frankly, there isn't any more in here than you could get for free from the Apple site. There should be a Dummies University for people like me the Dummie's books make learning easy and fun. 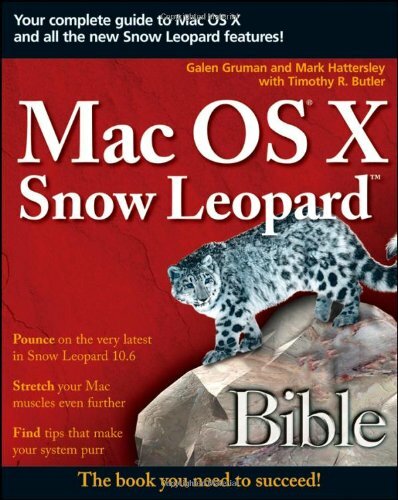 It is the one and only book you need to get the most out of Snow Leopard. Want to try life outside of Windows?You've come to the right place. Users are switching from PCs to Macs in droves, and now you can, too, with this helpful guide. In a fun, but practical way, the book walks you through the entire process-hardware and software-including selecting a Mac, moving files, setting up security, and getting the most out of all the fun stuff that makes Macs famous, such as the iLife suite, and more. An excellent resource and I really didn't have to purchase the other , Snow Leopard for Dummies. I bought this book to help me learn how to use a Mac because I'm a PC ; )I haven't finished it yet but thus far it has been most helpful.This book was an excellent choice.Easy to use and understand. If you are familiar with the "Dummies" series of books, then you won't be surprised or disappointed surprised with this edition. 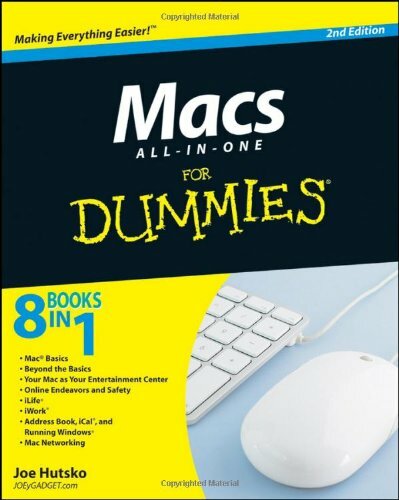 I am a novice Mac user and I have been attempting to make the adjustment from using a PC to a Mac.I thought written information would assist in my transition and, after receiving my dummies book, I immediately began reading through it.The Table of Contents makes it easy to find subjects you are looking for.The first chapters of the book are very basic, exactly what you would expect if you were new to the world of Macs.I will say that throughout the book, the author writes as an enthusiastic fan of Mac products and his cheery attitude builds excitement for making the change to Mac. As I skimmed through the information I was familiar with, Ilearned about the command key and other unique features of the Mac. Chapter 5 was the most helpful one for me because it contained a great table comparing terminology between Windows and Mac. Also included in Chapter 5 was a list of keyboard shortcuts. Tips, things to remember, and warnings are highlighted throughout the book making it easy to thumb through chapters and find important items.The author spent quite a bit of time discussing passwords and security.One important thing I learned was that the author does not recommend downloading virus protection unless you are also planning to install Windows on your Mac. I was especially interested in learning about Snow Leopard but was disappointed when reviewing the book.Although the book's cover states "get the most from Mac OS X Snow Leopard" I didn't find any specifics.The book does state that Snow Leopard is an updated version of the Mac operating system and is version 10.6.Information on what makes Snow Leopard a better operating system would have been helpful, even if release notes from Apple had been included. What helped me: Chapter 5: Mac OS X for Windows Users.This chapter, as I stated earlier in my review, has terminology, keyboard shortcuts,and information on Time Machine and Time Capsule and other differences between Macs and Windows. What I have yet to explore:IPhoto (Chapter 12), Producing Movies and Music (Chapter 13), and Building Your Space on the Web (Chapter 14). I have uploaded photos to my Mac and my son has used IPhoto to play a slide show accompanied by ITunes music.The slide shows are so much fun to view. Bottom line recommendation about book:This book provides a good overview of the differences between Macs and Windows.The author definitely is a Mac fan and recommends Macs for their quality. You can find terminology, program information, and lots of tips if you have questions and don't want to search Help on Apple's web site. All of Pogue's manuals are very useful and user friendly. This one is no exception. For prior PC users, it is very helpful to have a book that provides a painless transition from one platform to the other. I just finish reading the manual this week.I am first time Mac user.The manual was very useful to inform me what Mac can do.It helped me understand the button functions and get more familiar with the Mac.It is easy to understand andI would recommend this manual to others. So far this book is helping, but it doesn't seem to address using a Windows keyboard. I am a PC to Mac convert. Five years ago I purchased Switching to the Mac (Tiger Ed.) which made me a David Pogue fan of all his books('The Missing Manual'). 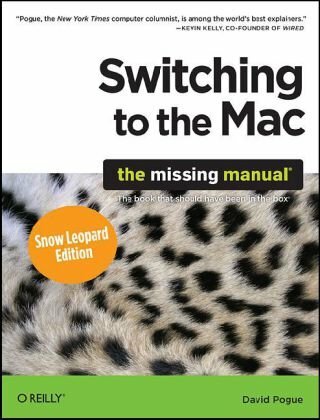 Recently purchased the manual on the iPhone and the Leopard version of Switching to the Mac. His books are comprehensive, great graphics and formatted in a very easy to read and understandable style. Intermixed with humor and many examples makes it a fun way to learn a technical subject. Considered a classic by an entire generation of Mac programmers, this popular guide has been completely updated for Mac OS X. Don’t know anything about programming? No problem! Acclaimed author Dave Mark starts out with the basics and takes you through a complete course in programming C using Apple’s free Xcode tools. This book is perfect for beginners learning to program. It includes all–new Mac OS X examples! 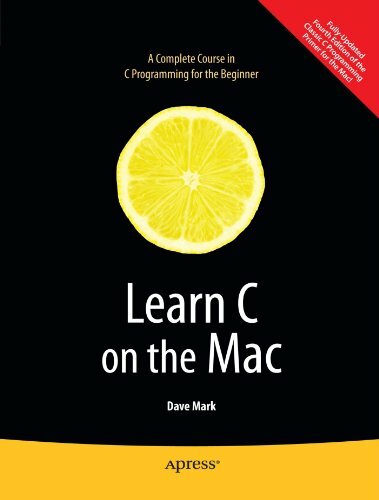 Master C programming, the gateway to programming your Mac or iPhone. Write applications for the Mac OS X interface, the cleanest user interface around. Understand variables and how to design your own data structures. Work with the file system. Connect to data sources and the Internet. For anyone wanting to learn to program in Mac OS X, including developers new to the Mac, developers new to C, or students entirely new to programming. For anyone who wants to learn how to program their iPhone, this is also the core language primer. This isn't quite the caliber of Greg Perry's "Absolute Beginner's Guide to C," but it is a worthy effort and does quite well in teaching C basics.There are some inconsistencies in difficulty level, however.For example, some topics are presented in a very beginner-friendly way, while other topics that are difficult to understand are quickly or not thoroughly covered, though you're expected to understand them. All-in-all I think it's a good primer for someone getting ready to learn Objective-C. I'm on chapter 5 of this book right now and I'm having trouble mustering the will to contuine. I have taken it upon myself to teach myself computer programming. Most reviews for this book touted it as excellent for beginners. However, I am finding it to be contrary. The book has conveyed a lot of key ideas very well, but instead of having you write out the code you're learning and then testing it, the book provides complete examples of mini-programs. This is a terrible way to learn this material. The book should be formatted such that it explains what the basic parameters of a C program look like. Then they should explain what each of those parts do and mean. Then the student should add small chunks at a time, altering the previous code. Instead, it gives you full code and hopes that you can remember everything that was taught without having practiced it yourself. This book MIGHT be good if you remember everything you do without having to interact with it first, but for the normal human being who can socially interact with others, this book falls short of its potential. I actually did this sort of backwards. I got halfway through "Beginning iPhone Development" and realized that I needed to learn more about the basics of Objective-C. Therefore, I went back and read through "Learn Objective-C on the Mac". With that I was able to get some working prototypes of apps on the iPhone. However, whenever I'd look at some bits of code, there were things I knew to do because I saw other code do it, but didn't really understand why I was doing it.It was then that I realized I needed to stop playing around and get serious about learning the C language. I came to this book thinking, "Alright, I'll learn a thing or two, but I know most of this because I'm actually making apps already." Boy was I wrong. Sure this book went over a lot of programming stuff that I knew (if statements, expressions, etc) but it also pointed out a lot of stuff I didn't realize about C.
The main reason I came to this book was to answer some pretty basic questions about pointers. I see the snippets of code below and wonder, what's the difference? How come I see the ampersand sometimes? What does this arrow thing mean? Therefore, I was very grateful when I realized that there was an entire chapter just on pointers alone. It's been over 10 years since I've used a language that supports pointers, so I definitely needed the refresher. The book answered all my questions and some I didn't even realize I had yet. If you're having problem understanding pointers, get this book for that reason alone. This was also my first tech book on the Kindle. While the source code snippets was a bit small in a few instances, most of the time there was nothing I missed about the physical book. In fact, I liked being able to review the pointer chapter again and again throughout the day on my iPod Touch. If I had bought the physical book, that simply would not have happened. I am already a programmer but new to C. I recommend this book. It explains code and the initial set up in detail. Some people may think it has too much detail but I'd rather have more than not enough. I find C tedious compared to the high-level languages I have been working with (COBOL and Natural). This book does a great job explaining the concepts and the codes so it has helped. The author is thorough and uses a bit of humor and keeps the reader engaged. He doesn't use too much humor and that's good. I don't like books that appear to be 'childish'. Anyway, this is a wonderful book and I enjoyed reading it and learning C.
Recently I downloaded Kindle for the Mac, and out of interest I chose the Kindle version of Learn C on the Mac to experience Kindle in action. The Kindle version did not display any book page numbers which was immensely frustrating since it was hard to gauge where I was in the book without referring back to the table of contents. Not a satisfying user experience. The book itself is a little higher in quality than complete drek but by a narrow call. Most of the code is built around creating a DVD library - using the terminal for all input and output - a very historical if not dated approach more suited to a 386 PC from the 80s. It is a very simple project, too simple in my opinion for what the Mac has to offer. Code slices are available from the book's website. A long list of bugs are reported by readers on the website along with author responses. Some of the bugs are just down to bad proof reading, but others are more serious. e.g. operator confusion. Towards the end of the book, a short piece on binary trees and searching is preceded by an even shorter piece on recursion (using factorial as exemplar). The author professes himself a fan of Knuth's work so surely something more substantial could have been presented. This book has the basics I needed to operate my new Mac.When my computer locked up I couldn't 'control-alt-delete' - doesn't work for a MAC!I really needed this book!Sounds VERY simple, but it sure stumped me!This book will really help you if you're new to a Mac. The book itself was in surpub shape.The delivery on the other hand took a very long time for my liking. I love the "Dummies" series and this one is no exception. I learn so much useful every day but important "stuff" from these books. Great MAC book! The only Apple-certified book on Mac OS X Server v10.6, this comprehensive reference takes support technicians and ardent Mac users deep inside this server operating system, covering everything from networking technologies to service administration, customizing users and groups, command-line service equivalents, and more. Keyed to the learning objectives of the Apple Certified Technical Coordinator certification exam, the lessons in this self-paced volume serve as a perfect supplement to Apple’s own training class and a first-rate primer for computer support personnel who need to support and maintain Mac OS X Server as part of their jobs. Self-quizzes reinforce lessons. I purchased this book to prepare for Apple's ACTC certification. I was also hoping that it would provide a useful introduction to some of the general concepts about server administration. However, I was ultimately disappointed about the book's usefulness in the later regard. The book covers most of the major functionality that is included in Mac OS X Server 10.6. It provides useful descriptions of available features and incredibly detailed setup guides that take you through the setup and configuration of each service with extra detail for directory services and authentication/permissions setup. The author uses both screen shots and text instructions to illustrate each procedure. These make the book easy enough to follow along even if you don't have access to a non-production server to play around with. My only major complaint was that the author doesn't always go into detail about why you would want to select a certain option over another, especially in areas where the computing environment needs to be taken into account (All Mac clients, All Win clients, etc.). This kind of detail would have made the book more useful as reference for real-world applications. That said, if you're needing study material to help prepare to take Apple's Certified Technical Coordinator certification tests, this is the book that you need. Maybe not a bad newbie book. It regurgitates the online help. I bought this book because I was having problems setting up my 10.6 server (after having last done such work with 10.3). All together I was disappointed with the book. I could not learn anything from it that was not in the help and hints on the server itself (or in the Apple support pages). It's very basic. Beyond that, for real problems, Google searches and blogs offer much more. It could well be helpful to people who are preparing for a certification test or just don't know much about servers. There are introductions to each section which attempt to explain what the server does in each respect (AFP, mail, chat, etc.). I hope it helps some people. 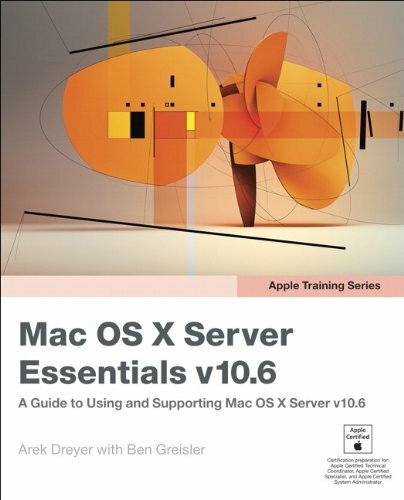 "Apple Training Series: Mac OS X Server Essentials v. 10.6" is just what it says it is: a book on how to get Mac OS X 10.6 Server up and running, and how to configure it to support different types of environments and users. It is organized into major topics according to server services(mail services, file services, Web services, etc. ), and richly illustrated with screen shots. As the book is frequently used in classroom settings, every chapter has a classroom-style review section. But the book is not written as a textbook; you can skip around from topic to topic and use it as a "how to" guide. The book assumes you are familiar with the concept of server services and have either a Mac OS X or Unix/Linux background. None of the topics is covered exhaustively, and some services -- the firewall, for example -- are essentially not covered at all. The emphasis is on getting Mac OS X 10.6 Server up and running quickly and supporting users. On the whole, it is an excellent introductory volume. I would have preferred a better index, and almost every chapter could easily be expanded into a whole book. But judging the book on its intended audience and purpose, it is a winner. This was the first time I ever ordered anything from Amazon and did so because I finally invested in a Macintosh and really needed the $35 manual but didn't want to pay full price.So I found one that was "used" and since it was only $1.59, I decided to take a chance.Well, this so called "used" manual came to me practically brand new.And right away too, with no problems.Am very happy with how the whole thing was handled and how I was kept informed of what was happening.This manual is greatand it very easily helps me whenever I need it.Thank you Amazon.This used book is just as good as a new book. This book is on my desk allthe time and has answered more questions than I thought I'd ever have and solved a lot of problems. Macs are supposed to be intuitive, but apparently I have no intuition!This book is exactly what I have needed. The book to read when there is no book. This book did not arrive as the merchant (reanimationed) decided not to send it. Instead, I received an email to say that it would cost too much to post and that I was being given a refund instead. This message was sent one week after I received a message from the merchant saying that the book had been shipped !!!! I emailed the merchant asking for an explanation but this failed to produce a response. My wife got me a Rosetta Stone program last December. Well I was running Panther and couldn't get started. After getting Leopard installed I automatically got Pogue Press' Missing Manual. The perfect companion for taking the Microsoft Office suite to the Mac! So you finally got a Mac, but you’re not looking forward to figuring out how Office works in a different environment? No worries! All you need is Microsoft Office 2008 For Mac All-in-One For Dummies to learn the fundamentals of Office 2008. With six books in one, it shows you how to use every Office 2008 for Mac application, so you can start getting things done right away. It's rare to find a tutorial so well written and organized. This is my 2nd "for Dummies" series purchase and would recommend it to anyone who wants to get a handle on Microsoft Office 2008 for Macs quickly and easily. I also advise actually creating a project for each section (each office application -word, excel, entourage and powerpoint) - it's a fun and practical way to apply the instructions, test your comprehension and put the application into practice in a tangible and memorable way. Make it as challenging as possible - a newsletter in Word that uses all the graphics and tools including creating tables/graphs and charts requiring excel and/or transferring creations between applications. You'll amaze yourself and be amazed at what you can do and how far Office has come along. But remember, practice makes perfect.And as a person who develops marketing communications and does graphics and design for a living - while it's not Adobe Suite - it's important to be skilled and capable in Microsoft Office as most clients run Office as their primary platform for communications and for business. This publication is good way to develop these skills quickly and stay competitive in today's rough economic environment. The only Office Mac book you need! 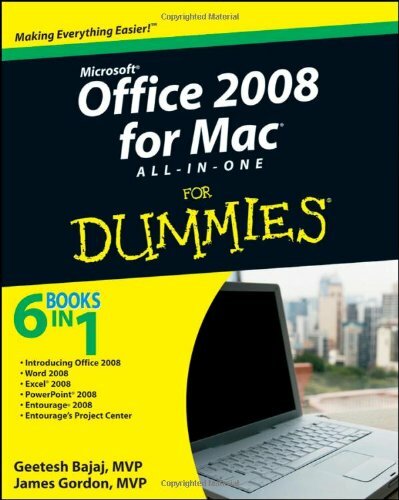 I own another of Geetesh's PowerPoint books, and I am so glad that the Dummies folks got him to do this Office Mac title - I tend to use both Windows and Mac versions of Office, and I have always felt that Office Mac books are very sketchy without all the details. This book finally gives all the basics, all the details, and more! You can make out that both the authors (Jim Gordon co-authored this one with Geetesh) know their stuff, especially when you read the sections on Excel and PowerPoint - this is so awesome! 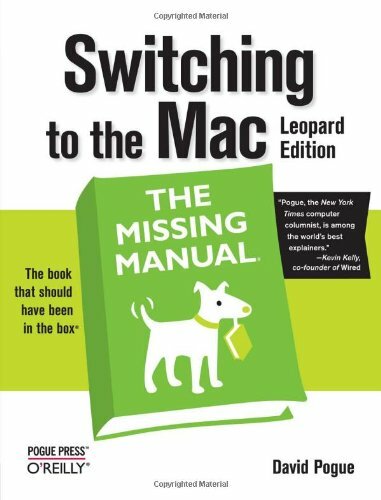 Don't use Office Mac without this book. This is one of the best books in the Dummies series that I have purchased. Although I have some familiarity with Office 2008 for Mac, I wanted an easy to understand book that would not overwhelm me with technical details, but instead give me practical explanations and tips for using Word, Excel, PowerPoint and Entourage. This book does exactly that. I checked out various books in the bookstores before I ordered this from Amazon. I think that for the average user like myself this is a great way to learn the basics, with the opportunity to delve more deeply if you wish (this book is about 800 pages including the index). The book is well written, well organized, and contains lots of tips and shortcuts. I highly recommend it. 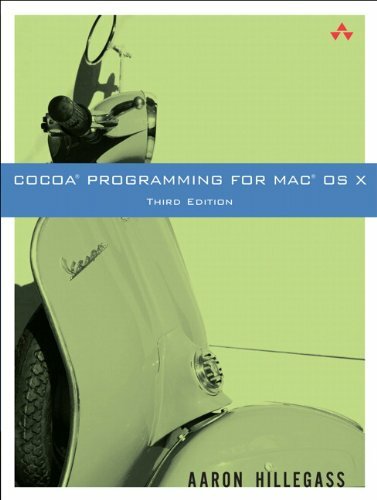 Suitable for anyone with a little C/C++ programming experience who wants to create software for the newest Mac platform, Cocoa Programming for Max OS X provides a slickly packaged and approachable tutorial that will get you started creating state-of-the-art Mac programs. The smart presentation style and easy-to-understood code examples help make this text an excellent resource. (It also helps that Aaron Hillegass is a truly engaging writer.) He first explains how the legacy NeXTSTEP platform has evolved into Cocoa on the Mac OS X. Beginning with short examples illustrating the actual Cocoa tools in action, the author gets you started with simple programs for a random-number generator, a raise calculator, and other comprehensible examples. Rather than just listing APIs and classes, the emphasis is on hands-on Cocoa development. An early standout section provides a nice tour of essential Objective-C features you'll need to know to use Cocoa effectively. More advanced user interface features get their due by the end of the book, including cutting and pasting data through the Cocoa pasteboard and also adding drag-and-drop support. Final sections look at creating new controls for use with the Interface Builder palette, and, briefly, how to use Java with Cocoa (an option that the author doesn't necessarily recommend). Throughout this text, the author provides more advanced, challenging problems at the end of each chapter for the "more curious" reader. This approach keeps beginners from getting lost in the details of Cocoa development, but gives the more advanced reader something more to do. The book is very well written, with pragmatic approach that will get you going with Mac Apps quickly. Nonetheless, it's impossible to follow it coherently since most of Xcode and Interface Builder has changed drastically since this book was written. For me it was too much. This book is really spot on if you have no Cocoa experience.I find that as I progress with Cocoa I really don't use this book much.The first 10 chapters are really good.I feel like some of the chapters in the middle go on and on and on.It's very difficult to make examples that are compact yet informative, but for the most part the book achieves that.Worth a read for sure.The AmaZone app example is great, although you'll have to make an extra NSURLConnection call to [...] to get your request signed before sending it to amazon.com. Despite the accolades by some, this is not a book for beginners.To learn programming you need lots of examples, lots of exercises in a defined problem space (so you can solve them! and learn...) and good explanations not only of what a particular feature does, but what it is for and how to use it, practically, and in your own programs.This book fails on all these criteria.Further, some of the examples don't work, and they are so complex that a beginner is baffled as to where even to start looking to fix them. If you don't know Objective C (which was my situation - my background was self taught programming in C and the GEM GUI on the Atari Falcon) or even don't know C, Steve Kochan has written an excellent book, "Programming in Objective C 2.0", on these issues and also on the Foundation Kit.His book satisfies all the criteria mentioned above.We need him to write a similar book on Cocoa.Don't waste your time, or your money, on Hillegass. After spending several fruitless months on Hillegass's book, I found free help elsewhere: my friends, the sad news is that there is no avoiding reading Apple's guides to XCode and Interface Builder, and above all, the Cocoa Fundamentals Guide, and dipping into other guides, as necessary.I recommend working through Apple's Cocoa Application Tutorial (much to learn there) and Apple's sample programs in the Image Kit Programming Guide (even more to learn, not just image-kit specific stuff) - and note that these programs DO work.The Wikibooks "Programming Mac OS X with Cocoa for Beginners" is another excellent tutorial, with excellent explanations. I also found the Cocoa tutorials by Julius Guzy (start at:[...]) to be invaluable. These have the great merit of focusing on just one topic at a time - so if you stuff up, as invariably happens sometimes, you have a defined problem space which, yes, you can indeed solve with some ingenuity and perseverance, and learn from having solved. I did a lot of research before buying this book, and the overwhelming accolades seemed to assure me that my [...] bucks would be money well-spent.Personally, I feel very let down by it. The way the author jumps into code without explanation, routinely giving you half a page of calls with absolutely zero previous discussion of what they do or where they come from, is both baffling and frustrating. Most of the exercises are conducted with a tone along the lines of "Just do what I tell you and it'll make sense later," which doesn't suit my learning style. Much of the book is focused on multi-chapter projects, which can be problematic for someone who has a project in mind and simply wants to learn how different aspects of Cocoa work. Also, the text really fails at answering any questions you might have about anything. Seriously, if you have a question in your head, you will never find the answer unless you muddle through the assignment. The book has a tendency to never talk about anything in particular with any depth, and only explains things in as much as they apply to the current example. 1) When you introduce a new object, give us a list of methods near the beginning of the chapter, so we aren't constantly guessing what you're talking about. There are times when every new line of code feels like a surprise. 2) Cover some basic things that actual people want to know. Here's a big one: "How do I open and parse a file?" 3) Take it easy on the line drawings. They sometimes make things seem a lot more complex than they actually are. 4) The cavalier handling of Bindings is often infuriating. I've re-read sections literally a dozen times without figuring out why things are bound to this thing instead of that. Anyway, that's just my two cents. This book is decent, and it will tell you how to do a LOT of things, but you really have to earn it. It's a textbook, and it expects you to follow a course from beginning to end. If you're not willing to do that, you really shouldn't pick up this book, as it will drive you nuts. Also, once it starts getting into writing code, you have to be patient enough to roll with it when you're confused. For me, the book left so many unanswered questions while I was working through it that I was almost perpetually filled with angst over things. I'd rather learn one thing at a time, learn it well, and move on to another thing. I own this book and worked through it fairly diligently.Having come out the other end of the book, I would say it provides a good foundation for continuing on, but I don't think this book is enough to start writing your own apps without some more assistance.I think it *almost* gets you there, but falls short in a couple of areas.I think if you buy this book with the intention of picking up one or more additional books to continue on, then this book will serve it's purpose, but I do think if you try and start programming just from this book, you'll be a bit lost when your done.I myself picked up Cocoa Design Patterns, which seems like a good next step so far.It provides a LOT less hand holding, but if you've gone through Hillebrands book, you should be ready for that anyway. I think if I could sit down with Hillebrand and make any recommendation it would be to either have put more into this book, or break it up into 2-3 books, with some additional details along the way.In many cases as I diligently typed in the code examples I was often somewhat lost as I went along.Some things became more clear as the book progressed, but others remained somewhat murky.For instance the chapter on drag-drop.There was a lot of code there, and not a lot of explanation.I see that there is a follow up book to this by him coming out in July, which I intend to purchase, and I recently bought his iPhone book, which while I haven't gone through it in detail appears to be improved over this in it's flow, or perhaps it's just that I know more about Cocoa in general that it's not overwhelming me. I can't say how difficult this book would have been without extensive OOP experience, but if your considering this as a starting point for programming, don't.This book, Cocoa itself is *not* for beginners.I would say you really need to cut your teeth with some general OOP concepts and put your time into programming them before you try and tackle Cocoa.PHP could be a pretty good way to build up your knowledge.It would allow you to learn programming and OOP while not getting bogged down with having to try and tackle interfaces, messaging etc.If you do already have oop experience, but don't know Objective-C, it's certainly different than other OOP languages I've used (Java, C++, PHP) but it's more syntactical than anything else.This book provides a decent primer on Obj-C and by the time I got past those primer chapters I was pretty set with regard to Obj-C itself. It's worth mentioning that while I'd say 80-85% of what he talks about re: the Interface Builder was still relevant, this being from 2008, the IB has changed with the most recent version just enough that when I started this book as a complete newbie, I got stuck in a couple places until I could gather the knowledge to understand where his instructions were no longer accurate.In the end for me some googling solved my hickups.So for anyone starting with this book and using XCode 3.2 or newer, know that you'll find a few things work differently, and also know that once you see what you need to do differently and understand it, the differences are pretty minor, it's just when your totally new and don't know the IB well enough, it can seem impossible at first.A little perseverance will get you through.It would have been nice if the author had provided a bit more updates on his website about the differences, he gave some info, but it was pretty cursory. To be fair I haven't finished reading this book yet but after reading the first few chapters its pretty clear that this is indeed a book for people who have used command line on other Unix systems or have a solid understanding on how systems operate. Although there appears to be a tonne of wealth here about OS X Terminal commands, the author only briefly explains the 'why' and then dives straight into the 'how'. For a newbie like me I was looking for a manual that would de-mystify the multitude of Terminal commands and throw in clear explanations on when and why. Having said that this book is still really easy to read even though it is assumed you know what is being talked about. There aren't 1000+ commands covered in the book. It's only 288 pages so unless there are 4 or 5 commands on each page (which there aren't) then it's not going to add up to 1000. There are probably more like 100 commands that, with multiple usage examples, may equal close to 1000 EXAMPLES but there are definitely not 1000 DIFFERENT COMMANDS covered in this book or any of the other books in the * Toolbox series. Outside of that, the book is a good introduction to the Mac OS X command line.I would give it 4 stars if the title wasn't outright false advertising. A more accurate title would be "Introduction to the Mac OS X Command Line" which would better describe what this book really is. Don't buy if you expect to learn 1000 new and exotic Unix commands because this book does not cover them. 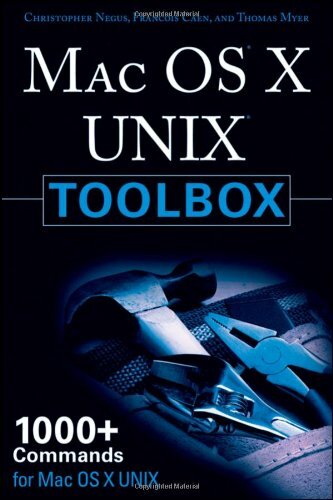 Do buy if you are looking for a simple introduction to the Unix core of Mac OS X. This booked is packed with well organized examples, but, the authors assume you already know a bit about about UNIX or Linux.However, the examples are so well done that even a complete newb to UNIX can figure it out (albeit with more effort and more slowly than someone who is already familiar with UNIX or Linux--difficult, but, not impossible).Great for a support tech, like me, who's been supporting Windows for years, but, has been suddenly (and joyfully) tossed some Macs to support. I'm giving it 4 stars as the publisher, Wiley Publishing Inc., decided to go cheap and print the book on paper thats usually used for mass market paperbacks.For a reference book I think that's a bit unacceptable--especially for the price. Easy to use, stable, and secure, Macs are ideal for seniors. This book explains everything new users need to know about this fun and intuitive platform. It begins with an overview of the different Apple laptops and desktops available, then takes an in-depth look at Leopard, the latest Macintosh operating system. Readers learn about organizing the desktop, managing files and folders, working with photos, videos, and music, using the Internet and email, sharing files with a PC, and much more. Just PERFECT for Mom and Dad, and their new Mac! This book was a gift, along with a new computer for my parents. The book is a basic, easy to read and understand guide for new Mac users, and is essential.Mac's have quirks and perks that that are in some ways similar to Windows, but there is a learning curve. My parents, in their 70's, needed an update, and a Mac seemed the way to go - if only for the screen reader function, that can help people get back on-line when there may be vision impairment (macular degeneration). I will admit, I am most familier with Windows, as are Mom and Dad.This book is step-by-step easy, and covers most things people use day-to-day, and NEVER "talks down" to the reader. Real life examples are used, and the user is encouraged to practice - a plus! It can also be a guide that you refer to off and on, and has a GREAT index.An EXCELLENT book for seniors, or for most anyone learning to love a new Mac! 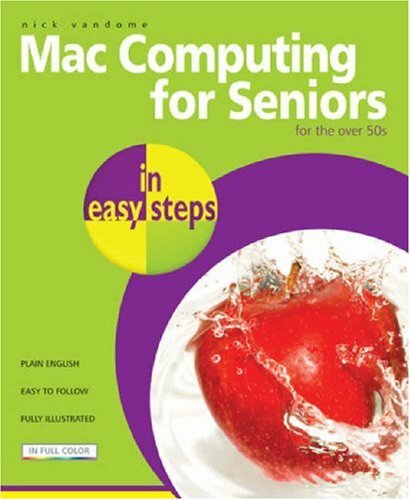 purched a previous book from you called "Mac for Seniors for Dummies. "This was a total failure.Very outdated and too technical. ÆMac Computing for Seniors is a much better choice. This is a good book.While it leaves out any discussion of a number of things I think a book like this should cover, it does cover things in a language which tries harder to explain how to do things than to impress the reader that the author knows all the jargon (far too common in computer texts). A great straight forwardbottom-line book without a lot of cute verbiage to read though.An attractive almost cheat sheet like approach. Fast and easy to use.You do not have to dig for the question and answer.Use this one and if you want to get really "techie" later use the big books. 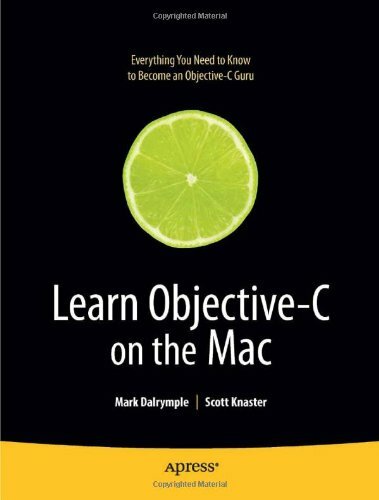 Take your coding skills to the next level with this extensive guide to Objective–C, the native programming language for developing sophisticated software applications for Mac OS X. Objective–C is a powerful, object–oriented extension of C, making this book the perfect follow–up to Dave Mark’s best–selling Learn C on the Mac, Mac OS X Edition. Whether you’re an experienced C programmer or you’re coming from a different language such as C++ or Java, leading Mac experts Mark Dalrymple and Scott Knaster show you how to harness the powers of Objective–C in your applications! Learn Objective–C programming, the gateway to programming your Mac or iPhone. Write applications for the Mac OS X interface, the cleanest user–interface around. For anyone wanting to learn to program native applications in Mac OS X, including developers new to the Mac, developers new to Objective–C, or students entirely new to programming. This book is poorly written and not well organized.I have to skip chapter to chapter to make sense of certain topics. This is a very well written hands on introduction to Objective-C programming on Mac for experienced programmers. If you are looking to learn Objective-C as your first programming language looks elsewhere or learn C programming language first. The authors did a good job introducing all the OO features of Objective-C and set you upon a path to do idiomatic Objective-C programming. The presentation style is also very engaging and help the reader to sustain his interest until end. I know a little bit of C and some basic programming concepts. But I'm already lost in chapter 2 (the first real chapter).The authors are strangely selective as to what they explain in their examples.The hard part of programming is learning the syntax, yet that seems to be what's left out.I'm finding that half of my questions on every example are left unanswered. So unless your extremely fluent in C, don't buy this book.I had been reading Kochan's book on objective c but got discouraged around chapter 7. Now I think I'll go back to it. I bought this book because I found myself getting completely lost in books, even beginner books, on programming the iPhone. I thought, I need more of a foundation (no pun intended) in Objective-C. Several books recommended Kochan's book, but, with a new edition coming out soon, I didn't want to buy the old edition. This book is a good solution to that problem. I'm an experienced Java programmer, but Objective-C has a few kinks that I just wasn't getting. This book is taking care of that. I like the pace - I can rip through it and think, oh, yeah, I get this, until I find something that's a little different, then I study that. And I like the sense of humor - a lot of "learn this" books get pretty dry pretty quickly, and that's just not happening with this book. This is a terrific book. A book that makes you feel like you can look up answers to problems encountered with a new Mac. I just finished reading this from cover to cover. I would have to say, it is probably the best introduction book I have read to any version of Mac OS X. It's size - packed full of information, yet not overwhelming. Great reference for those new to the Mac. Great keyboard shortcut reference for anyone who uses a Mac. Typo's, and I mean I stopped counting after 50! Grammatical error's! Enough of them to annoy you! Technical error's, however nothing not easily figured out on your own. All in all, it's a great introduction read for anyone new to the Mac! I would have given it 5-Stars, had it not been for the laziness exhibited by the editors! A great book, but it's difficult to find things using its index... the page numbers in the index are not correct, sometimes they are 10's of pages off!I can't give this many stars because of that.Sorry. I've spent hours trying to find what I'm looking for because of this. If you're still using a PC, why? Do you like to suffer? Now might be the right time to jump over to the Mac. One reason is the ease with which you can learn how to use the Mac's most advanced and most sophisticated operating system, the Snow Leopard. 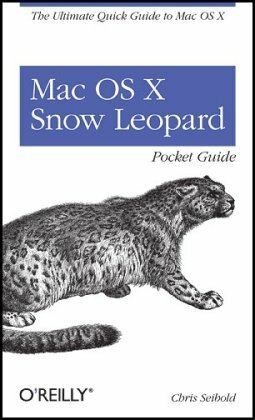 One such book you can turn to for honest-to-goodness guidance is Chris Seibold's //The Ultimate Quick Guide To Mac OS X: Mac OS X Snow Leopard Pocket Guide//. 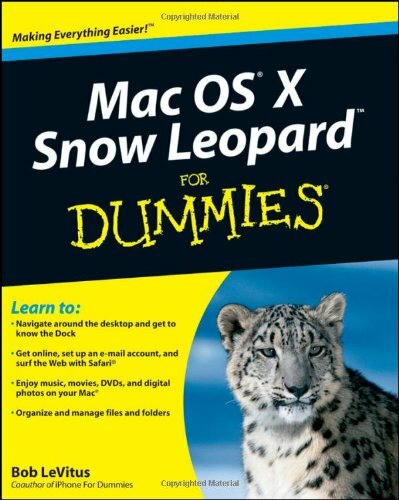 This handy book is the quickest way to get up to speed on Snow Leopard. It is packed with concise information in an easy-to-read format. It covers what you need to know and is an ideal resource for problem-solving on the fly. You can go right into the heart of Snow Leopard, using its details on system preferences, built-in applications, and utilities. You'll also find configuration tips, keyboard shortcuts, guides for troubleshooting, lots of step-by-step instructions and more. All you need to know is here, including new features and changes since the original Leopard release and quick tips for setting up and customizing your Mac's configuration, problem solving advice with handy references to the fundamentals of the Finder and Dock. Learn to manage user accounts and take advantage of Apple's integrated online suite of services and tools called MobileMe. You can master the world's best computer operating system, the Mac OS X, even while you are on the go, with this pocketable //Mac OS X Snow Leopard// by Chris Seibold from O'Reilly Media. Snow Leopard moves faster and roars louder than its predecessor, and this comprehensive guide shows you all the ways to get the most out of this powerful new cat. Explore everything from its muscular handling of applications and streaming media to its new, game-changing support of Microsoft's ActiveSync® technology. Get set up on Snow Leopard 10.6, learn professional-level security tools, and discover secret tricks and workarounds with this essential guide. One is still not enough. Of the two titles, Pogue still takes the prize.He may not provide as much technical, "inside" terminology as the "Bible," but the information is still all there, along with a certain empathy for the average reader's anxiety about computers and yet another new operating system. All the same, neither of these is a book to attempt using as a bedside companion or, for that matter, to read cover to cover (any more so than the Holy Bible, which is not to say either is not a good book).I suspect that, like me, many who elect to pick up either "The Missing Manual" or the Mac "Bible" will soon be trying to decide on a smaller complementary text that will be more convenient, more basic and simplified, more likely to actually be read.There are fine candidates by Williams, Carlson, the Mac Basics Superguide, and the Rough Guide.And since all of these publications become worthless the instant a new OS is announced, there are already good prices to be found for second-hand copies. It is for novice users as well as for pro users.For pro users it will be a good quick reference book.For novice users like me it is fantastic.Worth buying. Very good book, not much missing. I ordered this book at the same time as "Snow Leopard - The Missing Manual" by David Pogue. I highly recommend buying both books if you can. A few things I haven't found in this book, I find in the other, and vice versa. Or maybe a more complete explanation in one about something, than the other. Being brand new to the Mac, I feel like both books together give me the complete picture, and so far I have found everything I need to know, between the two books. This book has no depth of content at all!Many of the other reviews of this book must have come from friends of the authors.If you want to learn Mac Snow Leopard look elsewhere.The book is also of very very cheaply constructed with cheap paper and binding so it would not even be adequate for a reference text even if it had any real content.This book deserves zero stars.